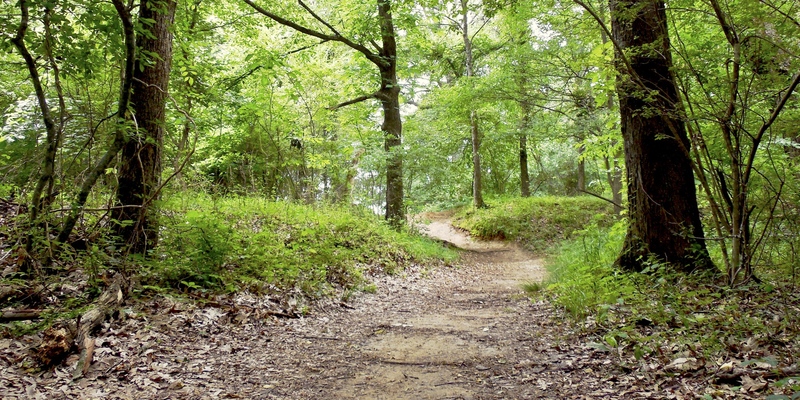 Escape the sidewalks and run, bike or walk any of the 40+ miles of scenic trails at Shelby Farms Park! Trails are multi-use (cycling + pedestrian, and some equestrian!) unless otherwise noted. Dogs must be on leash, leash in hand on all Park trails. To view a Park map, click here. This urban trail connects pedestrians and cyclists in Midtown Memphis through Shelby Farms Park to Cordova, TN. Learn more about this exciting rails-to-trail project here. Hit Shelby Farms Park's newest path around the lake in Heart of the Park! The Promenade is the Park's first separated-use trail, offering a 2.34-mile loop for pedestrians and a 2.45-mile loop for cyclists. This popular path travels through the northern portion of the Park. It meanders through pine and hardwood forest areas, past three lakes, and through the Woodland Discovery Playground. Walkers, joggers, bikers and inline skaters are allowed on the Chickasaw Trail. This is a multi-use track running parallel to Walnut Grove Road, on the south side, to the Germantown Trailhead. This trail takes you all the way from the Wolf River Bridge to the Shelby Farms Greenline! This trail takes you alongside Hyde Lake, next to the Park Entrance, and on part of the Chickasaw Trail to get through the Park to the Greenline. This loop travels through the northeast portion of the Park and is an excellent trail for hiking, running + mountain biking. The Tour de Wolf is under renovations thanks to a grant from the Tennessee Department of Environment and Conservation. Yellow, White + Blue Trails are located on the south side of Walnut Grove Road and wind through the Lucius Burch Jr. State Natural Area, paralleling the Wolf River. You can access the Wolf River Trail from the Walnut Grove Bridge or the Germantown Road Trailhead. Have your own horse? Then this trail is for you. This trail, which starts at Gate 11, parallels Mullins Station Road, crosses over the entry and exit roads (Gates 10 and 9), then heads into the pine forest. The trail emerges in North Orchard and heads west towards Chickasaw Lake.